One of the best parts of Halloween are all the delicious goodies that get consumed during this month. Although there are a lot of appetizing Halloween treats for sale in the store, sometimes there is nothing better than a homemade delicacy. Most of us are too busy to bake or think that most recipes are just too complicated. 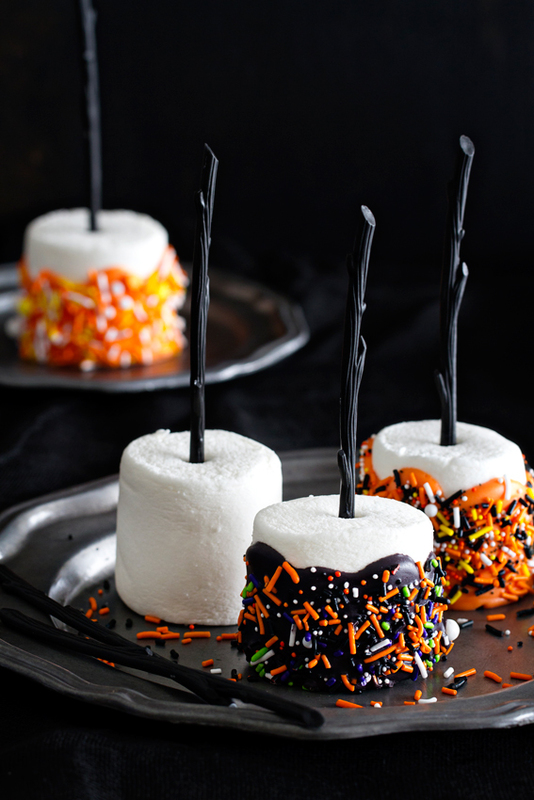 For everyone looking for simple yet fun treats to make this Halloween, look no further. Below is a list of enjoyable yet easy recipes that will delight both young and old on this all Hallows’ Eve! There is nothing more sinister than the apple thanks to the Evil Queen. Halloween wouldn’t be complete without the traditional candied apple. Instead of a boring, old caramel covered apple, why not spice it up with a twist. The “Poison” Apple is a black candied apple. Not only is it delicious but it also makes a great Halloween decoration. This recipe only requires 5 ingredients and is only 4 steps! Wash and dry 12 apples and then place them on a baking sheet. 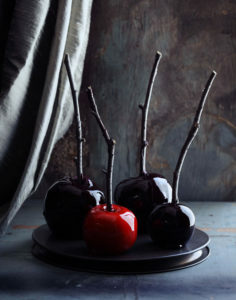 Poke a hole in the middle of the apple with candy apple stick or use twigs painted black for a spooky twist. Line a second sheet with a buttered parchment paper. Place a candy thermometer in a medium saucepan and add 1 ½ cup of sugar, ¾ cups of water and ½ cup light corn syrup. Place over medium heat and whisk until the sugar is dissolved. Let the temperature rise without stirring until it reaches the hard crack mark at 310 degrees Fahrenheit and the remove pan from heat. Remove the thermometer and add the black food coloring. Swirl the food coloring in the pan until the color is completely black. Twirl the apple in the candy and then shake off the excess. Place the apple to dry on the buttered sheet and repeat! 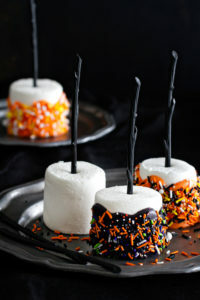 Marshmallows just aren’t for the campfire, they can also be used to make a scrumptious Halloween treat. This is another recipe that only requires a few ingredients and is super easy to make. All you need is 12 giant marshmallows, a bag of 10-ounce candy melts and some assorted Halloween colored sprinkles. Insert a lollipop stick into a giant marshmallow; find some Halloween themed lollipop sticks here. Once the candy has melted, spoon the candy melt over the sides of the marshmallows and allow the excess to drip back into the bowl. Dip marshmallows into the candy. Coat with festive sprinkles before the candy melt dries. Place marshmallow on a baking sheet until dry. Repeat with every marshmallow. What would fall be without a delicious pumpkin flavored treat? As the pumpkin spice lattes take over, making a pumpkin spice flavored Halloween dish is sure to be a hit at any party. 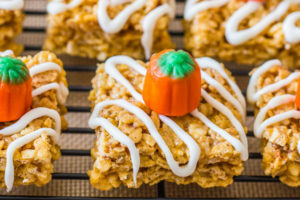 It is a known fact that Rice Krispie treats are the easiest dessert on the planet to make and adding pumpkin makes it an easy delicious fall version of a classic. For this recipe, you need the classic Rice Krispie ingredients plus some canned pumpkin and pumpkin pie spice. Cook 4 tbsp butter in a large saucepan over medium heat. Once the butter melts and becomes a golden brown, add ¼ cup of canned pumpkin and 10 ounces of marshmallows. Stir until the marshmallows are melted. Add ½ tsp pumpkin pie spice, ½ tsp of vanilla extract, and a pinch of salt. Stir in 5 cups of Rice Krispie cereal. Once everything has been stirred together, press the mixture evenly into the greased pan and let cool at room temperature. Leftover Halloween candy is tasty by itself but when combined with other Halloween candy it becomes a delectable smorgasbord of deliciousness. 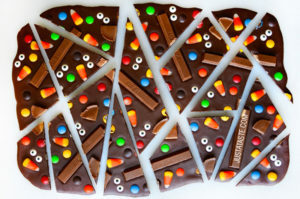 Halloween Candy Bark is a super easy way to use all that leftover Halloween Candy. This easy recipe is also a fun activity to do with your kids. Your kids can get creative with decorating the candy bark. All you need is 3 cups of bittersweet chocolate chips and 2 cups of chopped up Halloween candy. To add an extra creative touch to the candy, add sugar candy eyeballs. You can purchase them here. This recipe takes 5 minutes to prep and 5 minutes to cook. Melt the chocolate chips in a double boiler in the microwave and stir until smooth. Carefully pour the melted chocolate on the parchment paper and spread it evenly using a spatula. Sprinkle the chopped up candy on top and carefully place the candy eyeballs throughout the chocolate. Place the baking sheet in the refrigerator and let cool for 45 minutes. Remove the bark from the refrigerator and place it on a cutting board. Cut bark into smaller pieces. Halloween sweets are great but now it’s time for a little adult fun with the Bourbon Pumpkin Pie Milkshake. Not only is it delicious but it’s a great way for those over the age of 21 to celebrate Halloween. The Bourbon Pumpkin Pie Milkshake is the perfect way to get into the mood for the Halloween. This recipe requires a few more ingredients. 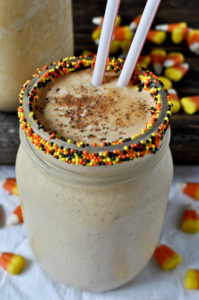 You will need 2 cups of Vanilla ice cream, ½ cups of milk, ¼ cup cream, 1 tablespoon of vanilla extract, 2/3 cup of pureed pumpkin, ½ tablespoon of pumpkin pie spice, 1/3 cup of crushed graham crackers, a pinch of cinnamon, 2-3 ounces of bourbon, Halloween colored sprinkles and frosting for the rim of a Mason jar and whipped cream to top it all off. Add all the ingredients except the frosting and the sprinkles into a blender and blend until everything is mixed together. Rim mason jars lightly with frosting and dip the rims into the sprinkles. Pour the milkshake into the mason jar and sprinkle cinnamon on top. Top with a dollop of whip cream and enjoy! 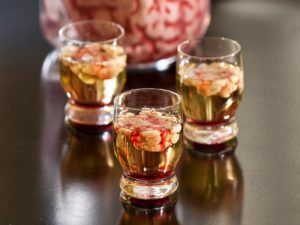 Continuing on with the adult theme of delicious Halloween themed cocktails, a favorite at any party is sure to be the Bloody Brain Shooter. This yummy and unique take on a Halloween shot will both delight and disturb your guests. This shot is another fun way to celebrate with friends and family on Halloween. The recipe does not require a lot of ingredients but can be slightly tricky to make especially the brain part. The recipe calls for the following ingredients: 1 ¼ ounces of Strawberry vodka, 1/8 ounce of Lime juice, ¾ ounce of Bailey’s Irish Cream and a splash of grenadine. These ingredients yield one shot. Chill vodka beforehand in order to ensure smoothness. Add the vodka and the lime juice to a shaker and vigorously shake. Pour mixture into a shot glass. Dip a straw into some Bailey’s Irish Cream and then cover the top tip of the straw in order to hold the Bailey’s in the straw. Submerge the straw tip into the shot glass and slowly release your finger from the top. The Bailey’s will curdle in the shot and create a strand effect, which will look like a brain. Pour a splash of grenadine over the “brain” to create the appearance of blood. 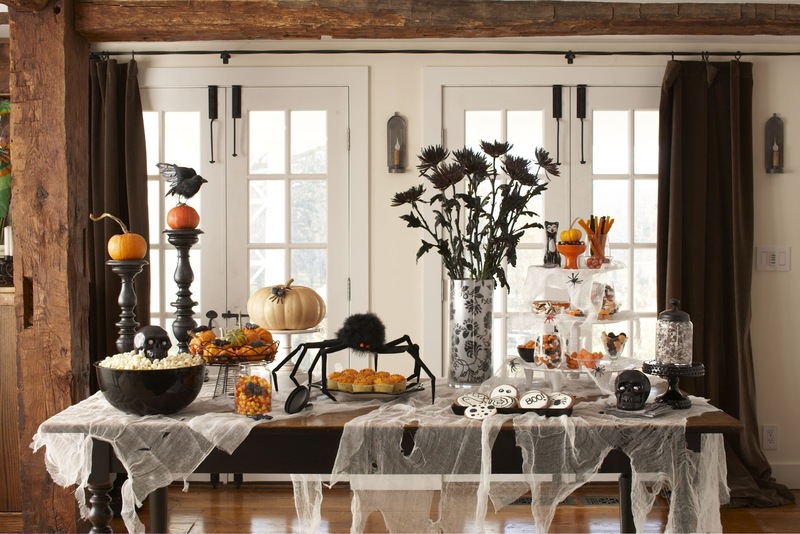 When planning a Halloween party, your desserts don’t have to be elaborate or complex. The best treats are sometimes the simplest to make. Halloween is the most sugarcoated time of the year and the best way to celebrate is by making delicious treats and drinks. These simple recipes are sure to be a hit with both adults and children. We would love to hear your favorite Halloween recipes. Tweet us to let us know how you like to celebrate Halloween!